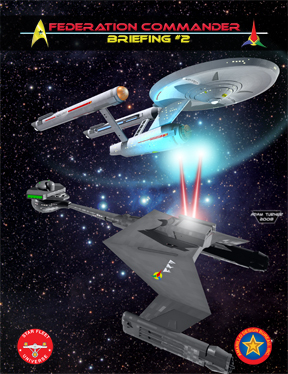 Amarillo Design Bureau’s latest expansion for Federation Commander, Briefing #2, is very well timed considering the recent release of the new Star Trek movie. Briefing #2 takes Federation Commander back to the ‘Middle Years’. In the world of FC (and SFB) the Middle Years are the closest thing to the period of the original Star Trek series. Briefing #2 is a very straightforward expansion. The Briefing includes a brief history of the Middle Years, one page on tactics, ten scenarios, and 72 ship status displays. The scenarios are a nice mix of large and small and most can be played with the various races. The heart of the product is of course the Ship Status Displays (SSDs). The included ships are all ‘pre-war’ versions of the various major ships from the various races. They generally have fewer weapons and defenses than their later war versions and make very interesting options to command. But it is the SSDs that also produce a major dissapointment with the product. The problem is that the SSDs are all in black and white not color. In the designer’s notes ADB explains that this was necessary due to the costs of providing 72 laminated SSD cards. Of course with printed black and white SSD pages players are forced to go make photocopies or scan and print the pages they want before they can even begin to play. One of the key advancements of FC over SFB was the use of color in the SSDs to aid in play. Thus Briefing #2 is a major step backwards, in more ways than one, for Federation Commander. It is one thing to have the occasional SSD in black and white but to have 72 of them in a key product is quite another. ADB obviously needs to produce a full-color PDF with the included SSDs (perhaps for $10?). They of course already produce full-color SSDs for their PDF Communique newsletter so this is nothing new for them. Moreover, considering the number of venues that currently sell PDF-based products, failure to produce the full-color SSDs is rather odd if not downright inexcusable. Briefing #2 is an interesting product and the various ships are a welcome addition to the FC system. But unless you enjoy black and white photocopied SSDs we have to say pass on this one until ADB decides to produce a proper set of full-color SSDs in PDF format. Disappointing. This entry was posted in Federation Commander, Miniature Wargames, Sci-Fi. I don’t really care about the color factor – plus it is cheaper to prinbt grayscale than color. I print my scanned color SSDs in grayscale anyway. I’m not sure why the reviewer is so focused on this – it reads very “whiny”, as in “Waaah! I want cowor!” The effect on game play is negligible, if anything.